My dining room holds some of my favorite pieces in my home, but it also holds some of the most expensive pieces in my home. Or, at least pieces that are typically at the top of what I would spend. Lucky for us, we actually scored a couple things at a nearby outlet; we also made a few splurges before moving in. But, with some of our higher end pieces, we also mixed in several affordable furnishings we’ve been more than happy with. 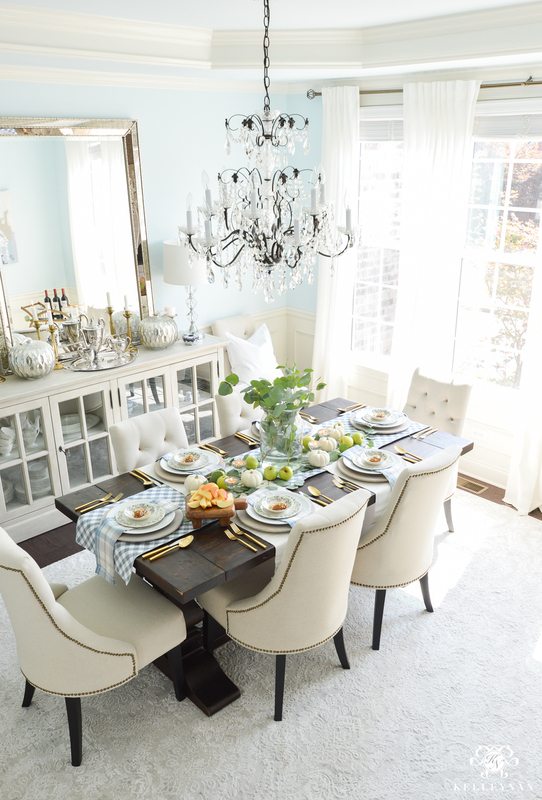 I recently had a reader write in and ask if I had suggestions for similar options on a piece that was out of her budget – and that’s how I came up with the idea to take on my dining room: look for less. 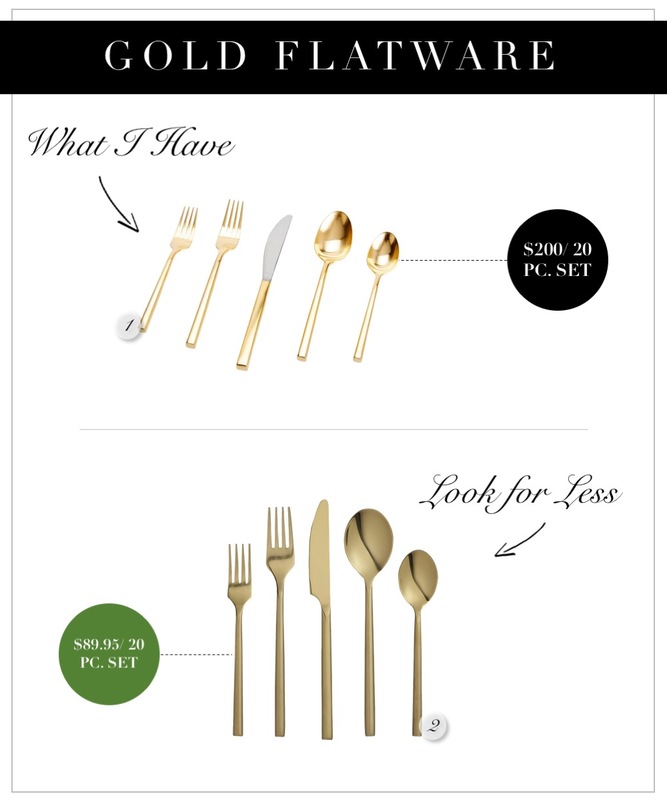 I’ve rounded up some of my post popular, most asked about pieces with similar alternatives at lower price points. Some share similarities while others are total ringers for the original I have. I love our dining room table. Like- L.O.V.E. it. I think it’s timeless and can lend itself to a wide range of styles depending on how you style the room around it. It is a bit more narrow than I would prefer but it’s beefy and classic and I’m so glad I didn’t go with something too trendy. 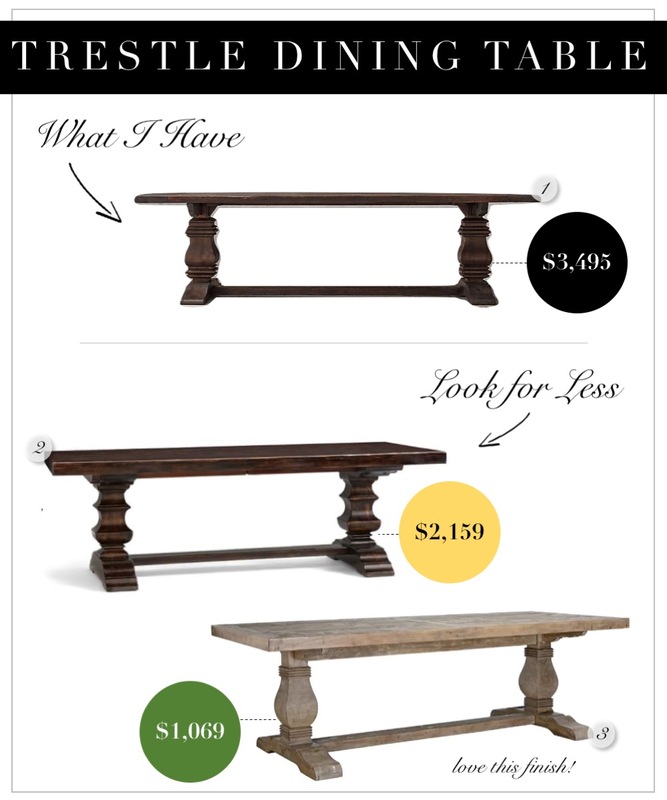 The first table alternative is really close in finish; while it is still isn’t inexpensive, it is substantially less than the table we have in the dining room. The second alternative is significantly less and I actually am crazy over the finish. 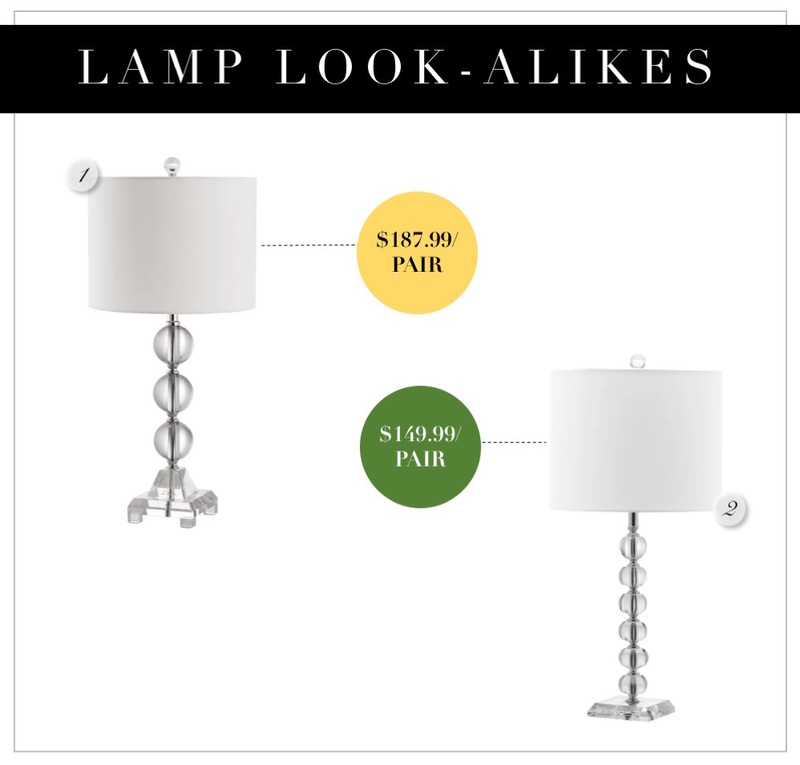 This was the fixture we splurged on during the build (at least, it was a splurge for us since we were outfitting an entire home with lighting). 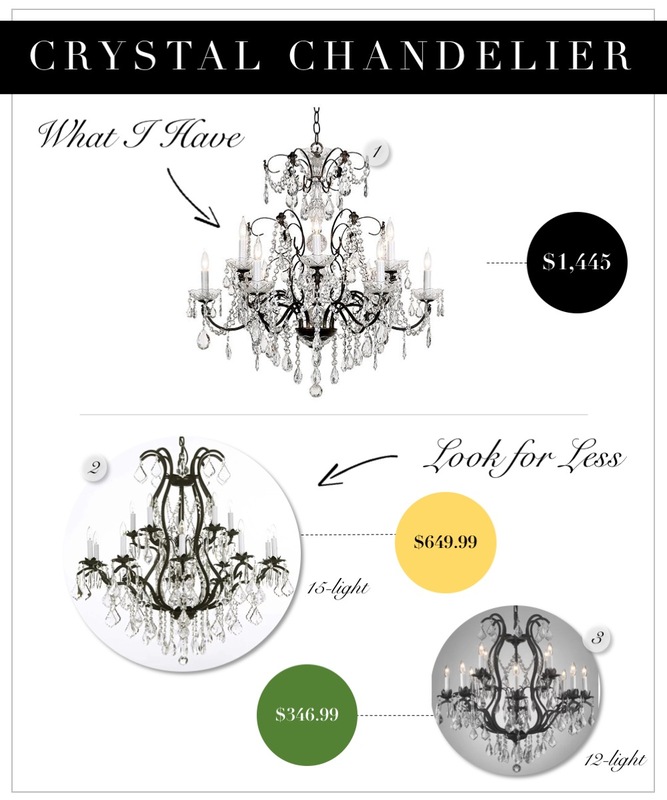 We actually went with basic, builder-grade throughout so many areas (to update as we were able at a later date), but I was set on having my pretty, statement chandelier when you first walk in the door. The first lighting alternative has 15 lights while the second has 12. What you can’t really tell is that my fixture is a dark bronze (but looks black, even in person) and the material of the dupes is actually wrought iron. My sideboard was another purchase prior to moving in. It is totally a lifetime piece so if you are going to splurge, this is a good place to do it. Like the table, it is timeless and lends itself well across so many styles; even as your tastes change and evolve, this sideboard will stand the test of time. 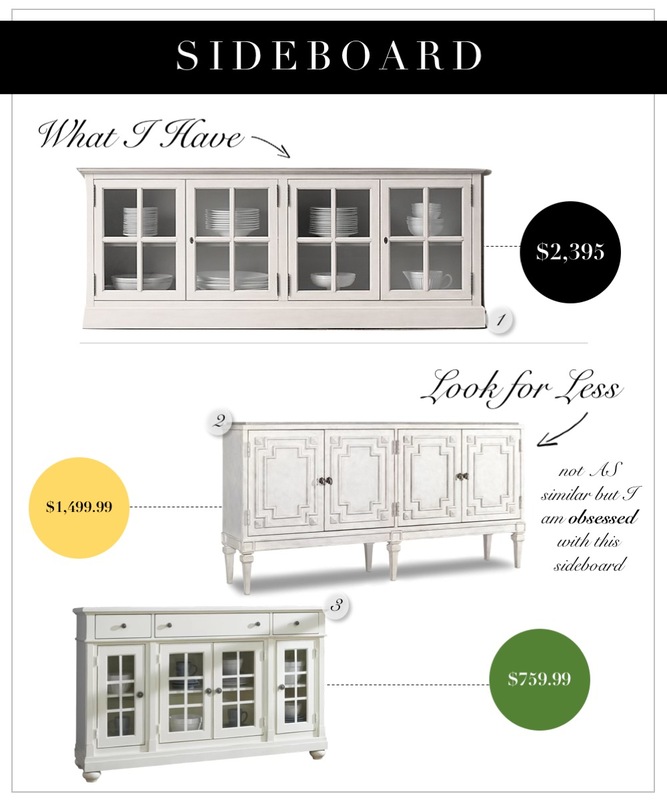 I didn’t find anything incredibly similar to my French Casement sideboard but I did find some great options for a similar look. I actually have decided I have to have (some how, some way) the first sideboard alternative. I mean, I am all over it. If it will fit in my breakfast nook, I may just have to “add it to the list” and work on saving for it. It isn’t cheap but it is still almost $1,000 less than the original. The second option is a little simpler but a great price. It also has a beautiful linen color (like the original) and isn’t too stark or white. 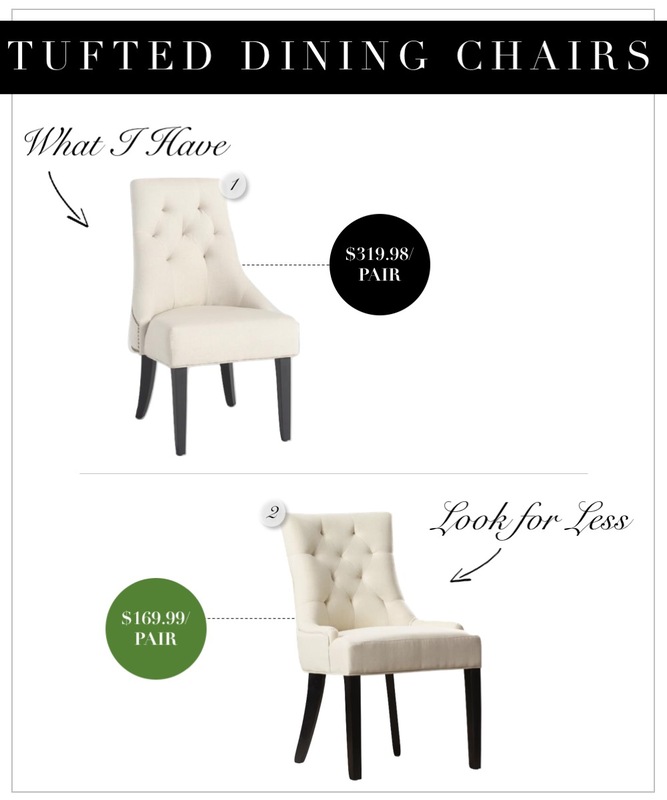 My dining chairs are actually pretty budget friendly in the world of dining chairs. These guys can get expensive! We have the same style stools (which we sit in far more often- hours every day) and they have both held up beautifully. 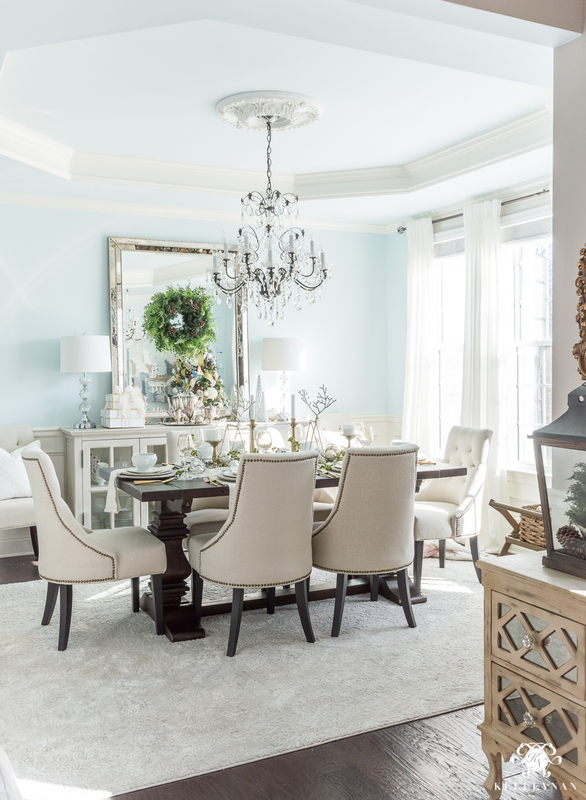 The similar option doesn’t have the nailhead trim on the back, but, if you don’t have to have that detail, you can score the alternative for almost half of the original. Both prices above reflect a pair of the chairs. 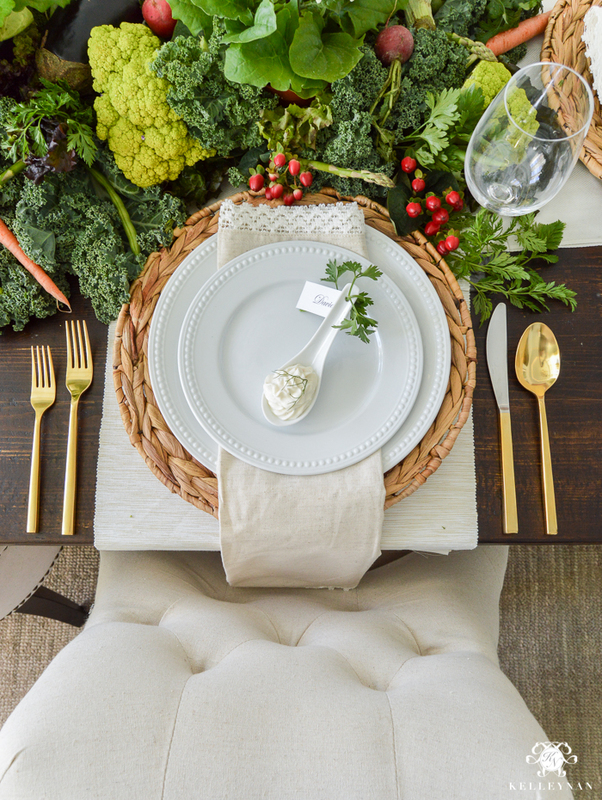 I have two sets of 20 of our gold flatware and we use it every time we entertain. One thing I really like about it is unlike our everyday silver flatware, it really hides water spots and imperfections well. This can get expensive and can be hard to justify, especially if you don’t plan to use it every day and don’t entertain often. I found a warm gold dupe for 40% of the cost of the set I have. I can’t speak to the quality or heft personally, but I check out the reviews and they are fantastic- 4.6/5 with over 100 reviews and raves. 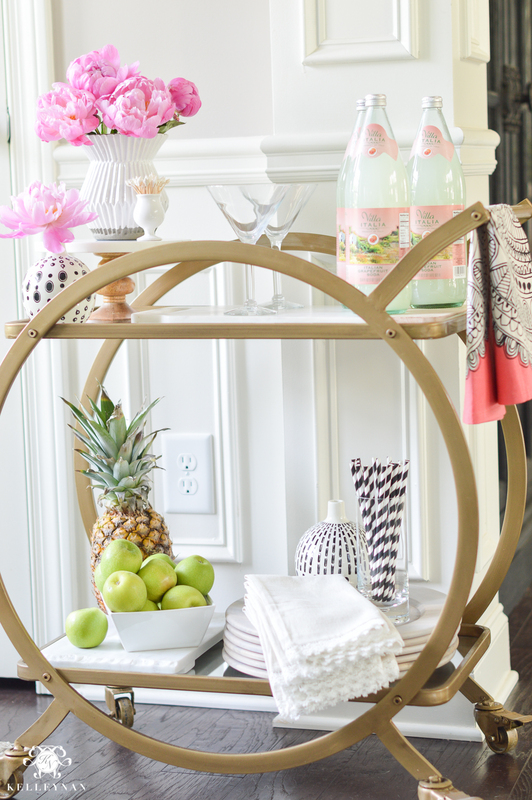 My bar cart is another piece that is pretty affordable. 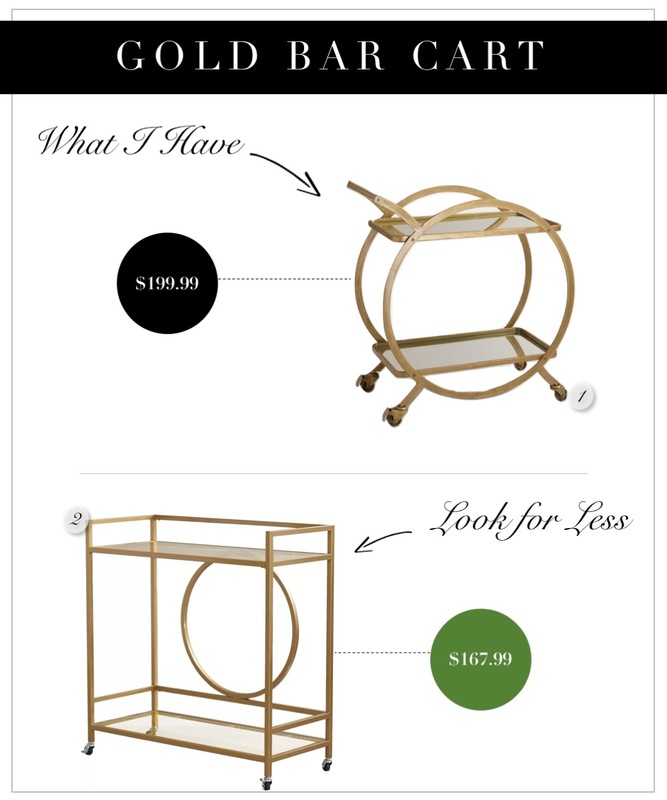 The true dupes to this gold bar cart are actually way more expensive than the version I have, coming in under $200. Since we are going the less expensive route, I found an alternative that still has the same finish and circle detail, but is a bit different. I believe the alternative actually holds more and would be easier to style (and position in the room). And, if you are limited on space in the dining room, bar carts are amazing to have for almost any room in your home- you don’t even have to use them as a “bar cart”. I actually cruised out to HomeGoods and purchased my lamps on a whim so I don’t have an online version of the originals. They seem to carry that style a good bit so if you have one close, I would start watching there first. If you don’t have luck, I found two alternatives that seem to be very close cousins to the ones flanking my buffet. Love this Kelley. I know this took quite a bit of time and research on your behalf to pull this all together. I think it is so helpful to those on limited budgets to know there are alternatives out there. You don’t have to sacrifice style due to budgets! My daughter is still in an apartment and loved all the gold flatware out there. She actually picked up a set from Ikea that she loves! She was going for the look, not necessarily the best quality. But, they are pretty. And, I have purchased a lot of our lamps at Home Goods. It does take frequenting them a bit to find the ones you like, but the prices are always good. 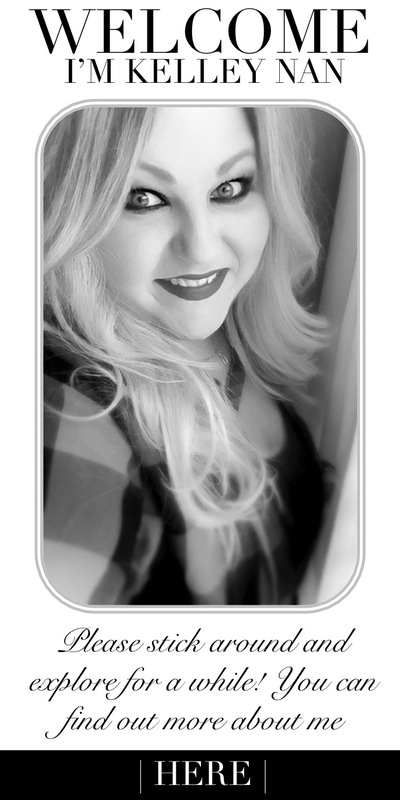 I have always been one to save up to splurge on good quality, timeless case goods. Those pieces that will be in it for the long haul. Loved this post. Very helpful. All of the alternatives are a good match and a good price. Thanks for doing this research and sharing! Great post Kelley! Much appreciated; I love your room and the dupes you found! Karen, thank you! 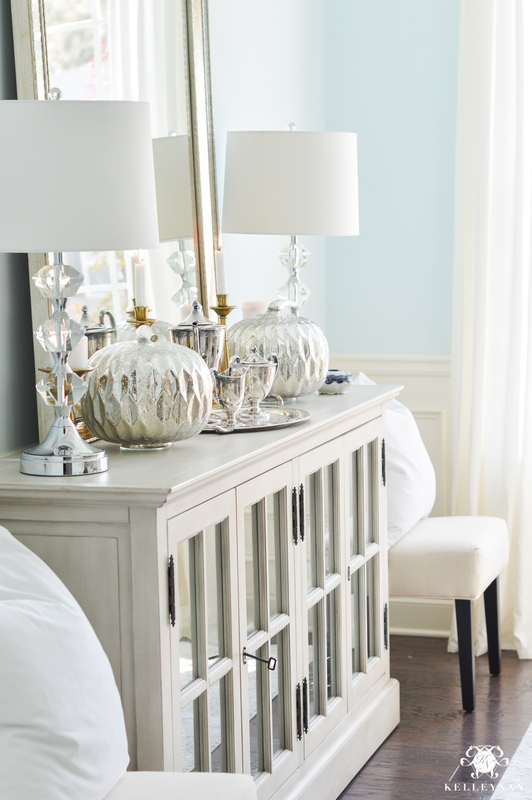 I am so lusting after that first sideboard! Hi Kelly! I’m so bummed to read that you got your rug at Home Goods. I was hoping to purchase the same online. Can you please tell me the rug dimensions? Is it 10×14? Thanks! Well, I have not splurged in a long time due to financial constraints, but like you, my number 1 splurge was always new sheets, new comforter and some pretty things for the bedroom. Linen has always captivated my attention and I love to sew on it when I canjust not always feasible. Would love a set of these sheets to boost my spirits and my spring! Lovely job, Cami! It feels so satisfying when we save for a splurge, doesn’t it? And we seem to appreciate those so much more! great post! I was wondering if you would comment on how your kitchen dining chairs are holding up? I’ve been contemplating them for our dining room but unsure of how sturdy they are. They’re beautiful but I’m scared to take the plunge. Thanks! Hi, Brooke! They are holding up well. We don’t use them that often but use their bar stool twin for hours every day (for the past 3 years) and we have beyond gotten our money out of them. Both are super sturdy! The price point is hard to beat. Hi! Sorry for yet another question but I was wondering what size rug you have in your dining room? We, too, have an 84″ table and I was hoping to use an 8×10 rug but not sure if that would be too small? Thanks!